TRIANA is the most legendary progressive rockband in Spain. Their stunning debut-album was a seminal blend of flamenco and progrock and paved the way to flamenco-inspired progrock in Spain, culminating in bands like AZAHAR, CAI, ALAMEDA, QUALDAQUIVIR, MEZQUITA and MEDINA AZAHARA. The story of TRIANA started in Seville, the beating heart of the flamenco. Jesus de la Rosa (keyboards/vocals) was a known musician in the local music scene and he even had international success with "Los Bravos" and their single "Black Is Black". But he wanted to form his own band to make progressive rock, so he recruited Eduardo Rodriquez Rodway (vocals/guitar) and Juan Jose Palacios 'Tele' (drums/percussion). The trio called themselves TRIANA, named after the most traditional part of the town and they moved to Madrid. With some help they were allowed to record their music in a studio with highly advanced equipment. In '74 "Triana" first released a single titled "Bulerias 5x8" (it became a failure) and then the debut album "El Patio" ('75). Unfortunately their flamenco-progrock did little, eventually the album sold 1000 copies. But after a big presentation in Madrid in '76, things started to improve and in '77 the second album "Hijos Del Agobio" came out, followed by the single "Rumor". The emotional lyrics (about hope after the end of general Franco's dictatorship) were embraced by the Spanish youth when the radio started to play "Rumor". TRIANA's music boosted the youth's identity and it gave them a way to show their emotions. And how ironically, TRIANA's music became less progressive while the band became more and more famous. Their third LP "Sombra Y Luz" ('79) sold 300.000 copies and from the fourth album "Encuentro" ('80) TRIANA turned out to be Spain's most popular rockband. 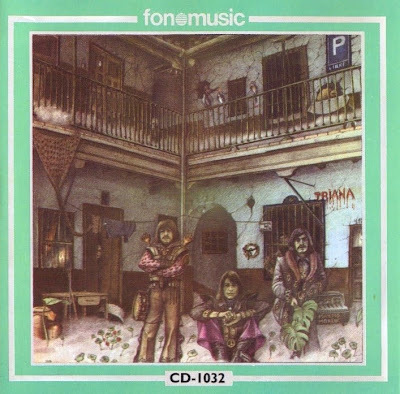 Further releases were "Triana" ('81) and "Llego El Dia" ('83) but then the story ended very sad because in '83 Jesus de la Rosa died in a tragic car incident and the other musicians decided to call it a day. Record company Fonomusic released some compilations, especially the beautifully packed 2-CD "Una Historia" ('95) is recommended.